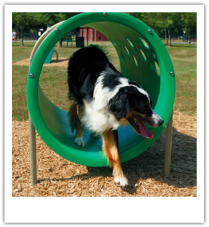 Dog park equipment is the key to transforming your typical dog park into a public destination hot spot. It's important to keep your dogs entertained while they're at the park with you; to facilitate this we carry several pieces of play equipment for dogs to keep them happy for their visit. If you're interested in constructing a complete agility course for dogs you'll find a plethora of dog playground equipment below allowing you to pick and choose the exact pieces you want to present. 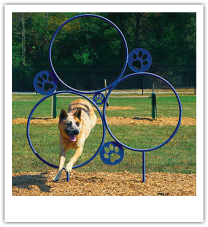 Additionally, we offer the choice of a complete dog obstacle course kits to take the guess work out of the equation.